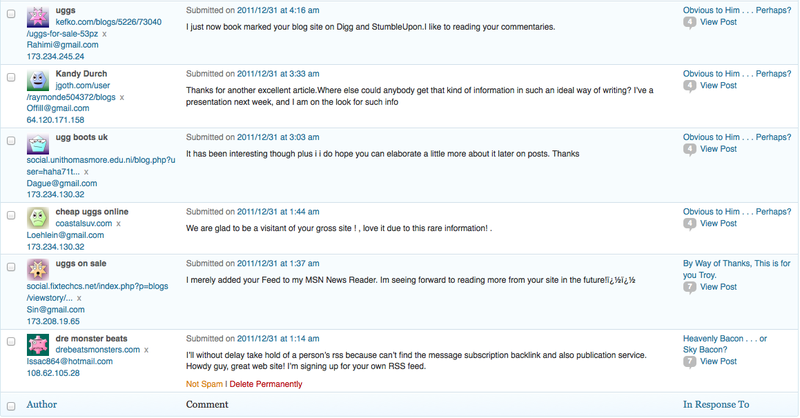 A while back I wrote about some of the spam comments I have gotten on this site. According to the plug-in, Akismet, which WordPress provides me, I have had 18,202 spam comments intercepted by them. By the way, I use WordPress “dot com”, not “dot org”, though I have been considering moving over. I have been very happy with WordPress’s offering and it’s really tough to beat the price. After I wrote that particular post, the number of spam comments I received seemed to level off at a tolerable rate; sometimes going for days with no flagged activity. However, during this holiday season it picked up dramatically and, in the past month I have probably been protected from a couple hundred spam comments. I think the biggest violator of my space has been Ugg boots (which hasn’t gone unnoticed by others), followed at a distance by Louis Vuitton. I have permanently deleted, collectively, a long essay’s worth of Cyrillic, some Chinese, a smattering of Hebrew, and quite a few short stories that made absolutely no sense at all. Invariably, the writing is atrocious. The most entertaining are the ones that seek to praise my writing style or the organization of the “site”, etc., presumably to flatter me so I won’t want to delete the comment. Fat chance! At any rate, I took a partial screenshot of some of the latest (they’re coming in at a furious pace lately) before I deleted them. I’m including it so you can see what I see. I imagine each one of these represents a person who has been suckered into paying money for these attempted backlinks, though my knowledge of SEO (especially “Black Hat SEO“) is insufficient to be sure I fully understand why so many would continue doing this sort of thing. I guess I’m naive. Fortunately, I’m not terribly gullible. Would You Pass Up Free Advertising? I’ve been concentrating on a couple of new clients and have neglected to post for a couple of weeks. During this time I’ve been thinking about some of the subjects I’d like to cover. One of those is the use of Foursquare for small, retail businesses. Actually, it can be used for virtually any type of business, but the usage model it presents is most applicable to businesses with lots of traffic and churn. I see them as being in somewhat of a pyramid. For instance, those businesses that will get the most value from Foursquare are restaurants, bars, and clubs. Next in line are retail outlets and, finally, service businesses with a brick and mortar location. Other types of businesses can use the service to get some free advertising, but if your business isn’t amenable to friends sharing the location (primarily because they want to enjoy each others’ company), it’s not going to have the same kind of value for you. As an example, there are Dentist’s offices who use it to present teeth cleaning and whitening specials. I am pretty sure people don’t check in to their Dentist’s office because they’re having a bang-up time and want to share it with their friends. However, everyone who uses Foursquare on their phone is going to get an impression of the special the office has created. You never know and, after all, it’s currently free! Thanks to a heads-up from one of my friends, @mor_trisha, I read an article at ClickZ (authored by Jeanne Jennings) making essentially the same points I wanted to make. I’d like give you my version of why I think Foursquare is an important channel for small business to use, with a bit of local flavor for examples. I’d also like to expand a bit on how to use the service if you are a business owner considering using it. 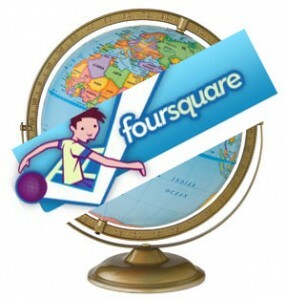 First, let me say a few things about Foursquare in case you aren’t aware of what it is and how it’s used. Foursquare is a location-based, check-in application that consumers with smart phones can download and use to find nearby locations their friends frequent, as well as check-in when they are there. In addition, those merchants who have taken the time to “claim” their venue using the website provided for their use can create specials to entice new customers and to reward the loyalty of their ongoing customers. More about that in a bit. As a user, Foursquare provides you with the ability to “check in” at a restaurant, pub, retail outlet, or service provider’s location whenever you are there. Using your phone’s GPS system you are provided, through the app, with a list of those venues that are close by. You can also see if any of your friends (or anyone else for that matter) is at a particular location so you can join them if you wish. In a rural environment or in a small town with few users, this capability is probably not all that useful. In my hometown, which is relatively small, the usage is now growing to the point where enough people are checking in for it to be useful. I imagine in large, urban areas it’s very useful – and likely lots of fun for some. There is also a couple of gaming aspects (points, earned badges) to using the service, but I’ll save that for another post. For business owners, Foursquare provides some interesting capabilities that are available for free. You cannot access them, however, until you take a little time to “claim” your venue. This is a relatively painless process that involves creating an account if you don’t already have one, finding your location on their website, and clicking on the link that appears on the right hand side of your screen. It says “Do you manage this venue? Claim here.” Once you click on the link you will have to answer a few more questions, then agree to receive a phone call where you will be given a four-digit code to enter on another screen. After that, you will have access to some useful tools, which I’ll get to in a moment. Now, I said relatively painless for a reason. I have had several instances where a business that’s been around for a long time was unable to use their phone number because Foursquare said they couldn’t verify it belonged to them. Since they had the number for quite some time, I’m unclear why this happens. Nevertheless, it isn’t the end of the road. Foursquare will give you the opportunity to have them contact you by snail mail, in which case you’ll receive the code you need as well as a cling to put in your window to advertise your presence on the site. Once you have claimed your venue you will have access to their “Manager Tools”. These include venue statistics, which will show you number of check-ins, social reach (whether or not the info was sent to Twitter or Facebook), time, gender, and age breakdowns (as available), and the profiles of your visitors. This information can be presented in numerous time slices, e.g. today, last week, last 30, 60, & 90 days, or all. All of this information is useful for understanding the penetration and coverage you’re getting with people who use Foursquare. Foursquare also provides some nice, printable flyers to hand out to your customers and your employees, so everyone knows how it works and what an “opened” special looks like. Hint – if it’s in black and white, it hasn’t been unlocked. There’s also a lock icon that appears as unlocked when it is. Ms. Jenning pointed out four good examples of how to (and not to) use Foursquare specials to get the results you’re looking for. I’d like to do the same for four locations in my neighborhood. They offer a standard check-in special. Each check-in gets you $10 off a purchase of $50 or more. With a purchase of exactly $50 that works out to a 20% discount; large enough to entice new customers. Frankly, I would have used a straight 20% discount, perhaps with a min (maybe even a max), rather than a minimum purchase. As it stands, if you spend $100 (and who spends only $50 on clothing nowadays?) you’re only getting a 10% discount. Maybe not enough to bring in new business. They also offer a check-in special of 10% off with every check-in. This isn’t a bad deal. Most people are going to go for ice cream or frozen yogurt after a meal, or as a summer-time treat, when they feel like it and, all things being equal, I would go to the place that offers a discount. Most don’t, so I suspect this is at least marginally helping them compete with the other venues in town. This one is somewhat similar to the example given by Ms. Jennings of Bangkok Joe’s. It’s a bit puzzling to me why they think this would entice anyone. They actually offer three check-in specials presented as one. Your first check-in is worth $2.00 on a drink, the second is $5.00 off any entree after five check-ins, the third is a free drink after 10 check-ins. This is not an inexpensive restaurant and I believe a normal meal, especially if it includes a drink, will cost at least $20. This makes the second of the specials worth about 5%; not exactly something to write home about. The same goes for the other ones. None of them seem very enticing. I’d be curious to know if they’re getting much action at all. I actually used the first one, but only because I went there to see a friend’s band playing. The waitress was unfamiliar with the entire concept, which leads me to believe they aren’t getting much traction out of the campaign. I’m not surprised. This venue is using a Friends Special, stated so: “Show you phone to a manager and get 20% off when you and 3 friends check-in to the same CPK! Excludes alcohol, tax & gratuity, gift cards. Not valid w/other offers. Valid at participating locations.” What I get from this is the place is probably micromanaged, as I find it a bit mystifying they don’t trust their wait staff to validate the check-ins. It’s also a bit comical to me they feel the need to qualify the offer so carefully. Lighten up! Nevertheless, 20% off isn’t a bad deal for a mid-priced meal with 3 of your BFFs. There are numerous other examples of specials being offered, many by venues you probably wouldn’t expect to find using them. I want to think about them a little more and maybe drop in to a couple to find out how they’re doing with them. The lesson here – if you’re running a restaurant, bar, nightclub, or a retail store with the potential for lots of foot traffic, your venue has probably already been entered into Foursquare’s database. Now you need to get out there, claim it, and start providing some specials to take advantage of what it has to offer. Remember, IT’S FREE, but that probably won’t last forever. Why not take advantage of it while you can? You’re welcome. Stalls at the Grand Central Market in L.A.
Perhaps this may seem strange, especially to those who’ve not experienced it, but I just love being out in places where there’s a lot of foot traffic and commerce is humming along. Although I fairly recently left a large corporation, where I worked in a windowless environment for a mostly faceless organization, I spent my formative years in very small businesses. My father was – after he took the money I got for my Bar Mitzvah to purchase a truck – a food peddler, selling mostly meat and cheese to places like the Grand Central Market in downtown Los Angeles. I used to love going to that market and walking through it to get to a hand truck or a small four-wheeled cart I could bring back to our truck to schlep boxes of product to some of the stalls we sold to or, better yet, to one of the walk-ins where the vendors kept their produce, etc. they would then put in their cases to sell to the public. There was one place that sold a lot of chiles and spices. I think the dominant smell in that cooler was Cumin, or Cominos. I loved going into their walk-in and would usually loiter there after I had unloaded the cart with the boxes of product they had purchased from us. 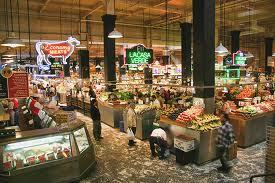 I was also introduced to things like lamb French Dip sandwiches and Orange Julius at the Grand Central. I can still hear my father pushing a cart loaded with meat and cheese, yelling “Wash (sic) your feet!” to warn shoppers of our presence. Across the street was one of the iconic places in the City of the Angels, a funicular called Angel’s Flight. It was an amazing ride to nowhere for me. Up the hill (Bunker Hill) and back down. No place to go, but I was in heaven on that little trolley. I’ve been back a few times since my father’s death just over twenty-five years ago and it never fails to give me the chills and warm my heart at the same time. Now when I go out to talk with prospects for my business, I find I’m getting the same old feeling. There’s a connection I can’t fully explain, though I’m trying to here. I hope it never goes away. It’s part of what makes everything I do worthwhile. I am constantly blown away by the quality and quantity of good information that’s available on the web. I have been studying the use of social media for some time; initially for use within the firewall of a large organization and, more recently, for small business marketing. One channel I think many businesses, especially those that experience high foot traffic, e.g. restaurants, bars, retail stores, is Facebook. I will never refer to myself as an expert, but I have been gaining some expertise in both the strategy and the mechanics of taking advantage of their fan pages. Unfortunately, I can’t keep track of all the good information that keeps being thrust my way! I want to share just one of them. I like what Jordan Julien has to say, though I find myself wondering why he’s not including mobile now in his assessments. Perhaps he is and I need to dig a little deeper but, for now I just want to share one post he’s written that I think is quite useful. It’s entitled “How Should I Use Social Media” and you can find it at http://bit.ly/ge2vwl. Check it out and see if it doesn’t clarify some things for you. Study the graphics carefully. There’s a lot of info packed into them. So, by my title I mean . . . I sometimes wonder why I blog at all, since there’s so much information out there; much of it far more knowledgeable than what I have to offer. I know there’s got to be a good reason, else why do I bother? I just came across a couple of quotes that rather succinctly state the issue anyone using Social Media for marketing needs to keep in mind with respect to engagement with their customers. I think it comes from some of the activity surrounding a virtual Enterprise 2.0 Conference event. I picked them up in my tweet stream. I wasn’t able to attend, but found them because I have a continuing search on the hashtag #e2conf, which keeps me in the loop. Part of the problem is trying to “control the message”. The conversation will happen with or without you. Your brand perception is now in the hands of strangers. Isn’t it time you got to know them? This is so important for small retail establishments to understand. With the advent of services like Foursquare and Yelp, the conversations about their businesses are already taking place. They need to, at the very least, claim their venues in each of these and get involved in the conversation. If a customer has a bad experience, don’t you want to know about it? Don’t you want to have the opportunity to make it right . . . publicly? It’s true and it’s only going to get “worse”. People ARE talking. Shouldn’t you at least be listening? Better yet, why not engage with them. I’m convinced the process will strengthen your relationships with your customers and do wonders to make you more accessible and easy to do business with.